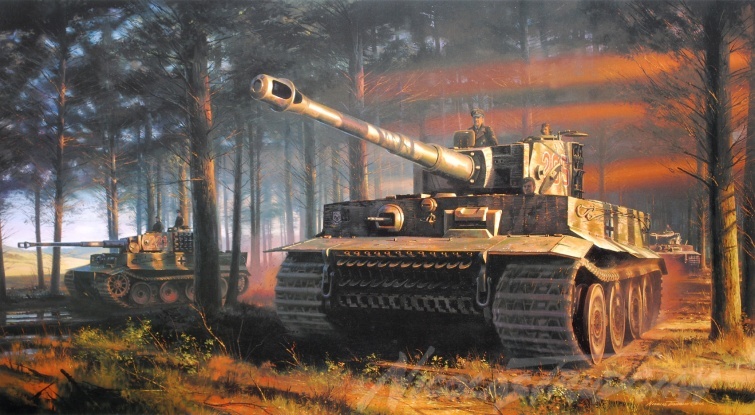 Tiger tanks of 2nd Kompanie SS Panzer Battalion 101 under the command of Obersturmfuhrer Michael Wittmann, the most successful tank 'ace' of WWII, prepare to engage advancing Allied armour, shortly after D-Day, June 1944. Each print has a unique original pencil drawing inscribed on it by the Artist, which can be drawn to your own specifications. Drawing size approx. 5" x 2". As this is a bespoke order please allow up to 4 weeks before shipping.